As many of you know, I serve on the Hoboken City Council. Over the past ten years I’ve been at the forefront of many positive changes. But I couldn’t have done it alone. I am deeply grateful to my colleagues and to my 5th Ward constituents for providing me with their support, their thoughts, their ideas and the opportunity to serve them and the City of Hoboken overall. It has been a pleasure and I’m proud of what our reform team, Mayor Zimmer and strong reform Council Members, have together accomplished. Finance, constituent service and quality of life issues have always been a focus for me, and I have worked hard to keep these issues in the forefront. But challenges remain. There are legitimate concerns about the direction of new development, adequacy of city services and Hoboken’s continued fiscal health to name a few. Mayor Zimmer’s announcement of her plans to not run for reelection provides us with an opportunity to take stock of our accomplishments, evaluate where we are, and to ensure that we address the greater good of Hoboken in the future. We have to adapt as required to best address the changing needs of all of Hoboken’s growing population – young and old, and across the widening socio-economic spectrum. I believe Jen Giattino is best suited to lead Hoboken now as Mayor. I give her my enthusiastic, unqualified endorsement. I have had the fortunate opportunity to work with all the major mayoral candidates over the last several years, and while they all have their strengths, none is more ready, none is as ready to lead Hoboken. As a Ward leader myself, I recognize how passionately Jen serves both her 6th Ward constituents and residents throughout Hoboken. Jen has the experience, knowledge, creativity, character, work ethic and determination necessary to lead Hoboken to future success. With her I am completely confident we will do what we need to do to continue to raise the bar – and not slip back to the secretive, weak and too often corrupt leadership of the past. Jen’s leadership is recognized by her council colleagues who have elected her Council President three of the last six years. She understands the core challenges Hoboken faces. In addition to quality of life issues, she has been the strongest voice in favoring commercial development which minimizes congestion and tax rates over residential which does neither and she has been unwavering in her support for greater financial transparency. She’s chosen a council slate with demonstrated experience in being tough on development, finance and negotiations -- three critical tenets to Hoboken’s future success. Jen has unparalleled respect among her neighbors both in and beyond the 6th Ward. She’s friendly and compassionate, and unequalled in Hoboken for her passion for helping people. What I love most about Jen is that she’ll work her hardest for any Hobokenite, supporter or not alike. Hoboken needs leaders ready to serve ALL of Hoboken. 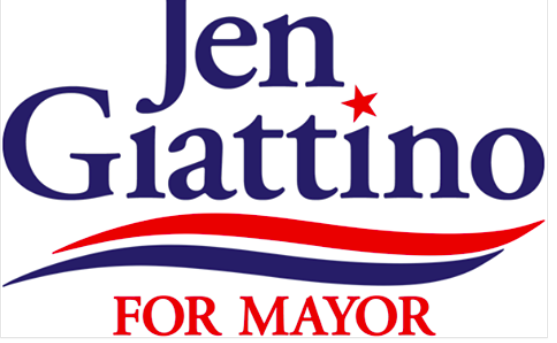 Please join me in supporting Jen Giattino for Mayor and her team of Jim Aibel, Sal Strace and Jason Ellis for Council.